Dr. Schmidt is a board-certified orthopedic surgeon. He received his bachelor of science degree from Louisiana State University and was then awarded his medical degree from Louisiana State University School of Medicine. He completed residencies in general surgery at the Oregon Health and Science University and in orthopedic surgery at Ochsner Clinic Foundation Hospital. 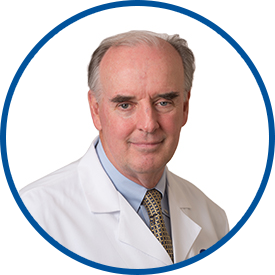 He had fellowship training in total joint replacement with Dr. Lynn Hamilton, Ochsner Clinic, New Orleans, and in spine surgery with Dr. James W. Simmons, San Antonio, TX. As an orthopedic surgeon, he specializes in hip and knee replacements, upper extremity surgery as well as musculoskeletal trauma. Dr. Schmidt is the first physician in Connecticut to be certified in the use of Xiaflex for treatment of Dupuytrens Contracture. He is also certified for endoscopic carpal tunnel release and has interests in robotic total joint replacements. He joined Westmed with Orthopaedic Associates of Stamford. He is affiliated with the Specialty Surgery Center of Connecticut, Greenwich Hospital and Stamford Hospital.